Jurgis climbs up to the tenement's garret to see his son's body. He is furious, and determined not to grieve. He does not go to the saloon to drown his sorrows; instead, he hops into a train car at the nearest junction and rides it out into the countryside. Despite his personal tragedy, Jurgis's alcoholism does not get the better of him. Instead, at his wit's end, he tries to literally flee his situation—he has followed Jonas's path, and seems to have come to the conclusion that family and love are destructive burdens in the world where he is forced to live, and that he must escape it in order to survive. The sights and sounds of nature shock Jurgis after three years in the city. He eats at a farmhouse and goes for a swim in a nearby pond—it is his first bath in months. He seeks out another meal at a different farm, but the farmer calls him a tramp and denies his request. Jurgis leaves, but as he exits the farm he uproots a row of young peach trees: Jurgis is emboldened by his freedom, and "from now on he was fighting, and the man who hit him would get all that he gave, every time." Once removed from the stultifying city and the burdens of having to support a family, Jurgis is again filled with youthful vigor. The farmer's prejudices no longer keep Jurgis down—instead, he is committed to fighting back. Yet his fighting back is destructive as opposed to building anything—he destroys the farmer's property in response to his insult. At another farm, Jurgis eats dinner with a farming family and spends the night in their barn. The farmer offers Jurgis a job until the winter, but Jurgis declines, saying he isn't looking for work at the moment. The farmer presses, asking Jurgis why he couldn't work in the cities during the winter, and Jurgis responds by explaining the wretched, competitive overcrowding of urban life. When the farmer tells him he will need a job once his money runs out, Jurgis agrees, but says he has no plan until then. Jurgis seeks to break as fully as possible with both the oppressive working conditions of the city and the oppressive constant need for money that is part of supporting a family. He simply wants to feel free instead of involving himself with work—to work only when he absolutely has to, which, as a healthy man able to forage for himself, isn't that often. Jurgis's life as a "tramp" has begun. Instead of asking for the help of farmers, who are mostly hostile to him, Jurgis sleeps in fields and abandoned buildings and forages food from fields. He doesn't worry about money, because he knows he can work paying farmhand jobs when he needs to. His "wanderlust" has returned, as has his youthful energy. He feels liberated, though not completely so: he is occasionally tormented by memories of Ona and Antanas. As a tramp, Jurgis has a chance to embrace individualism completely. However, his attachments to his family make it impossible for him to fully do so. As he travels, Jurgis meets other vagrants. Many of these men have also abandoned the struggle of the cities for a nomadic life. Others are less unfettered, and wander in search of seasonal work. Jurgis joins a work gang to help with the harvest in Missouri, and earns a significant amount of money. He recognizes that he no longer has much use for money, and instead of saving it, he splurges on a night of carousing in town. He ends the night by sleeping with a local girl. Jurgis is directionless. Without the motivation to save money generated by his love for his family and his desire to support and improve his loved one's lives , he squanders his earnings on transient pleasures. He has no dreams. He lives only for the present. After his wasteful, debauched evening, Jurgis is penniless and ashamed of his behavior. Some time later, during a rainstorm, he takes shelter with a Slavic family. Their baby boy reminds him of Antanas, and Jurgis breaks down in tears. He runs out into the storm and cries in the forest, thinking of Ona and Antanas. Jurgis's supposedly carefree, pleasure-seeking lifestyle proves too much for him to bear when he is reminded of the family he once had. He ran from the burdens of his family, but he cannot run from his love for them. Sobel, Ben. "The Jungle Chapter 22." LitCharts. LitCharts LLC, 5 Jan 2014. Web. 22 Apr 2019. Sobel, Ben. "The Jungle Chapter 22." LitCharts LLC, January 5, 2014. 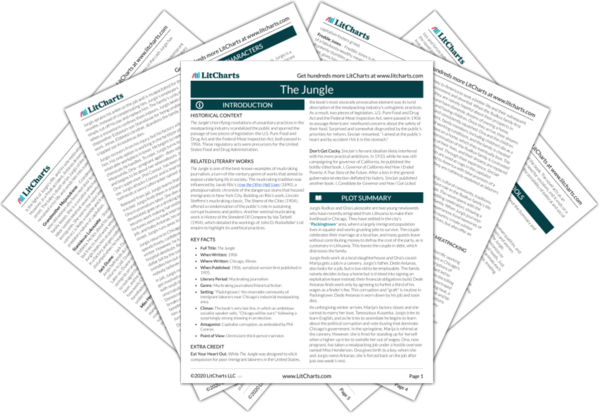 Retrieved April 22, 2019. https://www.litcharts.com/lit/the-jungle/chapter-22.